Goff’s Weld Grind Cell’s Modular Design Provide Complete Flexibility and Easy Process Flow Change! Free Standing Frame allows you to set the cell up anywhere to create a saftey work area to protect against welding sparks and UV light. Premium Replaceable Sections allow for easy replacement if any section gets damaged due to weld splatter. 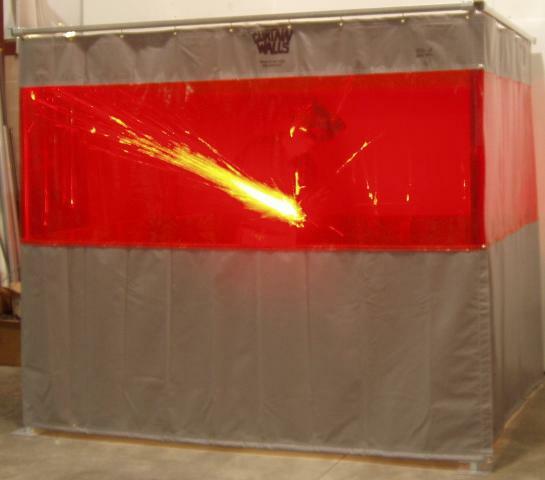 Welding Curtains & Screens also avaliable! Goff’s Weld Grind Cell Packages Come Complete with Floor Mounting Hardware! 16 gauge galvanized steel hardware pieces and nylon roller hooks.